Pseudo-secular politicians had been scaring Muslims for long of a saffronised India under Mr. Narendra Modi. Even figures like 22, 000 Muslims will be killed in that scenario were bandied about. [How was the calculation made is, of course, anybody's guess.] However, a quick survey of Delhi's Urdu Press, the only barometer of Muslim opinion in the country available, reveals that barring Shahi Imam's statement published in Mr. Aziz Burney's Azizul Hind daily, and the newspaper itself and a few columnists, no Urdu newspaper is engaged in scare-mongering. No dire predictions are being made. All have accepted the verdict of the people and say in a democracy the people's verdict should be always accepted and welcomed as it reflects the collective wisdom of the people. All editorial writers are asking Muslims to wait and watch for the promised good times. 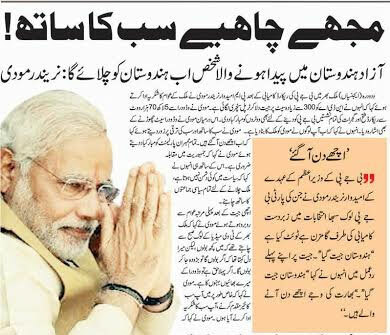 Indeed, some Urdu newspapers have even taken positive note of PM-designate Mr. Modi's remarks in his victory speech that he would carry every one with him. Also displayed prominently is BJP President Rajnath Singh's repeated advice to party workers that no remarks should be made against any community (read Muslims) in victory celebrations. Azizul Hind has also displayed prominently Shahi Imam of Jama Masjid Delhi's statement that the Mr. Modi's victory is "dangerous" for the country unless BJP changes its policies. Divisive politics cannot help the country. It will be very dangerous for the country, If the BJP implements its own policies rather than follows the Indian constitution, he is quoted as having said. The lone exception is Mr. Aziz Burney's Azizul Hind. Mr. Burney is a prominent Urdu journalist and was the founding editor of largest circulated Urdu daily Rashtriya Sahara for over two decades. Azizul Hind is his new venture and today's paper is the 337th day of its publication. His newspaper has come out with a black cover page. Apparently May 16, 2014 was a black day for him. 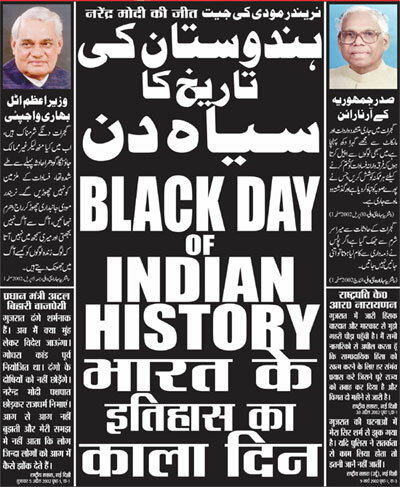 The Headline says it all: Narendra Modi's Victory: Black Day of Indian History. On the right panel is a quote from the former President K R Narayanan. It reads: I am deeply saddened by the continuing violence in Gujarat. I appeal to all people to make all efforts to end the communal violence that has destroyed the entire state and is continuing for the last two months. (Rashtriya Sahara, New Delhi, 9 March 2002, Page 1). On the left panel is a quote from former, first and only BJP Prime Minister so far, Mr. Atal Bihari Vajpayee: "Communal violence in Gujarat is shameful. What face will I show to the world. Godhra violence was pre-planned. Perpetrators of violence will not be forgiven. Narendra Modi should leave partiality and follow Rajdharma (moral duty of governance). Fire cannot be fought with fire. I cannot understand how people can throw living people into burning fire." (Rashtriya Sahara, New Delhi, 5 April 2002, Page 1). Azizul Hind's editorial is headlined: Secularism in Danger. It says: "The person who is considered responsible for the genocide of Muslims is going to be the prime minister of India. It is possible that some changes are made in the country's policies. It is a reality that minorities are scared of Modi and that his policies have always been anti-Muslim. Regardless of what Narendra Modi says about doing this or that for Muslims in future, the fact remains that a person who has grown in the lap of RSS cannot be neutral towards Muslims and Islam. The very basis of RSS philosophy is anti-Islamic and its objective is the establishment of a Hindu Rashtra (India as a Hindu Nation). ... In this scenario, RSS and its prime ministerial candidate Narendra Modi cannot think of doing any good for Muslims. Indeed, RSS ideology does not have a soft corner even for followers of Christianity and other religions. 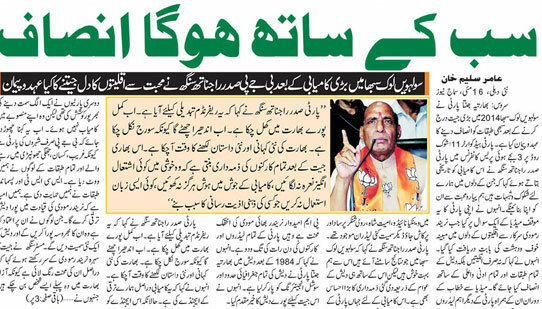 ...."
A prominent Muslim journalist Zafar Agha's column in Hamara Samaj bemoans the ineffectiveness of Muslim vote bank. He concludes his column in Hamara Samaj: "The result will be that secular politics in India will suffer unimaginable harm. Obviously this will hurt Muslims most. election results have decided that at least for the next two decades Indian politics will move in the direction of Hindutva, that is, Hindu nationalism, and Modi will dominate Indian politics for a long time. Muslims will have to face its worst consequences. Sadly there is no Muslim leadership that can guide the Muslims in this critical moment. If there are any leaders among Muslims they are no different from Meer Jafar and Meer Sadiq (synonyms for traitors). So not only one sees a dark period ahead for Muslims, but one sees Modi heralding the darkest period in the history of Indian Muslims." Mercifully, this is an exception. The only other newspaper that considers Mr. Modi's victory as the victory of communalism is Hindustan Express. It has published a column by Mr. Shahidul Islam headlined: Finally, Communalism Wins. But this article as well as its own editorial is largely non-committal. They take note of RSS's great contribution to Mr. Modi's victory but also put the blame for Congress's debacle on its own incompetence, lack of job opportunities and price rise, etc. No attempt is made of scaring Muslims about the days ahead. The editorial is titled simply: Unexpected victory. However, the editorial in Hamara Samaj merely bemoans the loss of secular parties and wonders who is responsible for the defeat of secular politics in India. It holds secular parties themselves responsible for their loss and says there must be something wrong with them to have suffered such a comprehensive defeat at the hands of parties that are considered fascist. Surprisingly the most balanced editorial is by Roznama Rashtriya Sahara which was nurtured from its beginning and for so long by a dangerous radical extremist like Mr. Aziz Burney whose new paper calls Modi's victory a Black Day for India. It says: We Respect People's Verdict. It says: "Since popular verdicts are a result of the collective wisdom of the people, they should be welcomed. This is the demand of the democratic principles as well. ... It will be premature to say how the new BJP government will behave, what attitudes it will display, what decisions it will take. .... In any case the government will be given time to reveal its policies and its attitudes. People are looking towards it with fear and expectations." 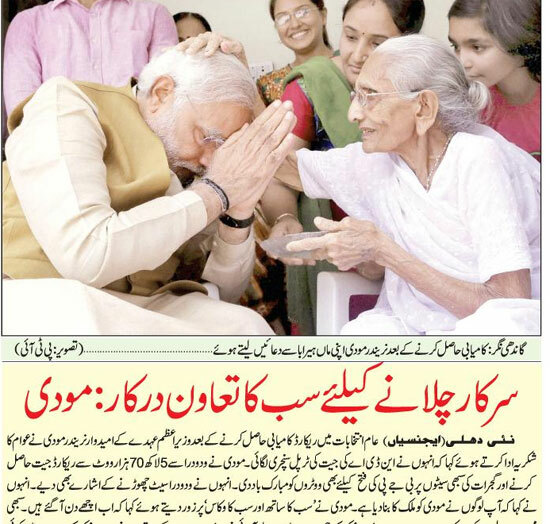 By constantly reiterating that BJP is anti-Muslim, the Urdu media is reinforcing this idea. I have been told by many that time has now come that Muslims will now be grated like carrot and radish! This is utter nonsense. We live in a multi-polar world and this idea of one over shadowing and over powering all the others is just not correct. We also need to understand that secular does not mean pro-Muslim and anti-right wing Hindus. I guess a lot of definition have been mixed up. May be it is bound to happen in such a was because our lives do not perpetuate with the compartmentalized world of definitions. I don't want Modiji to do something spectacular for Muslims to erase the imgae of Modi being anti-Muslim, I only wish that he makes our India better. My only concern is about his international relations policy. The problem with Modi-Muslim relation was less of animosity for each other but more of communication failure. Manmohan singh had his problem of being incommunicative, but incommunication comes in various other forms. Muslims intellectuals and leaders too are responsible for this. Otherwise hasn't more riots happened under Congress rule? But why is it that Modi stands out? He stands out just because he wants to and then you know it is but obvious that people take note of this. When he will promote capitalism and built big projects, wont Muslims be working on those projects for salaries? Wont Muslims too benefit? Some Muslims are complaining as if they were in some way in race of Prime Ministership. Muslims intellectuals must make Muslims understand that jab khaane ke vaande hon, to naaste mein gulab jamun nahi khojte, meaning when your priorities should have been to find jobs in booming India and be not left behind in its economic progress, you shouldn't be demanding for a Prime Minister of any particular hue. Let the Prime Minister be goonga or badbola, why should they care? Muslims must pay attention else where at least as much as they are interested in politics. Yes, but are we Muslims prepared to tell our friends in the pseudo-secular parties to not goad BJP to turn extreme right. Of course, it suits their divisive agenda but it does not suit the country and obviously whatever does not suit the country does not suit us. Can we ask them, please leave us alone, please leave secularism alone. When feeling any sort of problem and harassment, Muslims should leave everything up to Allah Almighty. One Islamic point they should always remember is that they should face everything in a tender way. Muslims must not make any unnecessary obfuscation and comments before BJP plays its promised role in economical and social development that in fact extends to every citizen of India regardless of religion, caste, culture. Koee shahar gumshuda hai, Koee ganv anmana hai .....Enhi khas uljhano se nya Adami bana hai....Mere khushnuma Earado meri dekh-bhal karna ...Kisi aur se nhi mera khud se samna hai..........................2--Yug ki aankho ko najar detd hu....Khwab par sach ki muhar deta hu.......Mai vo suraj hu Inqlabo k.......Syah rato ko sahar deta hu. Mr. Modi has not even been formally elected the leader of the BJP legislative party and is several days away from being sworn in as prime minister. But pseudo-secular parties have started forcing him to shift his attention away from his repeatedly-proclaimed developmental agenda towards the Sangh Pariwar's right wing communal agenda of yore. I was amazed to watch a Muslim spokesman of the Congress party ask the BJP spokesperson in a debate on News X TV Channel: So when are you building the Ram Temple? Now that you have a majority of your own, it is your bounden duty. You have promised repeatedly that we build the Ram Temple once we come to power on our own. When will you get rid of Article 370? When will you have a common civil code?" This is not an exact quote. I am paraphrasing. But you get the drift. One would expect VHP and perhaps RSS leaders asking this in a while. But while they are willing to give Mr. Modi a chance to turn a page and continue doing what he has been since he won his first election in Gujarat, albeit on a bigger scale, the so-called secularists will not allow him to. This is precisely what happened in the election campaign too. For the first several months the BJP campaign remained confined to developmental agendas. Younger BJP leaders who would want to talk about Ram Mandir, etc. were shot down by the seniors on the stage and asked to focus on issues of development and good governance. But the pseudo-secular parties continued to force the party to talk communalism. I cannot say that it was entirely because of this, BJP may have had its own compulsions too, but then we finally had the most vicious campaign in our history. I hope we Muslims can tell our friends in the pseudo-secular parties to not goad BJP to turn extreme right. Of course, it suits their divisive agenda but it does not suit the country. The results are out and the mandate given to Modi is clear and unequivocal. We have to respect this mandate. The lesson that Muslims ought to have learnt a long time back is that there can be a counter-polarisation of votes too. For a long time unscrupulous parties have capitalised on the Muslim vote bank through communal polarisation. Muslims have consistently been falling a prey to these machinations little realising that a time would come when counter-polarisation could also take place and render the Muslim vote irrelevant. Muslims have been fighting more over symbolic and emotional issues rather than substantive rights, thus providing grist to the anti-Muslim propaganda machinery that Muslims are being appeased at the cost of the majority community. Though the community failed to gain substantially in terms of economic improvement, job opportunities or educational advancement, the picture that was projected was that the successive so-called secular governments were pampering the Muslims. This lead to a rising angst among the more gullible in the majority community causing the counter-polarisation. Having said that, let us also not forget that a large majority of those who have voted for Modi have not done so with any communal agenda in mind. The development plank has been the motivating factor coupled with a quest for strong, decisive leadership. Modi, as a strong orator and no-nonsense leader stood head and shoulders above a bumbling Rahul Gandhi and an ineffective Manmohan Singh. Rhetoric held the sway and people were mesmerised with the image of the emerging messiah, the man who would carry India’s development and progress on his 56” chest. The young voters were swayed by the development mantra and the prospect of a corruption free administration. Therefore, it would be an injustice to the people of India to believe that they voted for a communal agenda. Do Muslims really have to fear a Modi dispensation? Time alone will tell. No doubt there will be pockets of discrimination maybe even physical attacks. What indeed has to be feared is any covert attempts that would be made to subvert the democratic and secular fabric of the country. The progressive intellectual section of Indian society has to be ever-vigilant against any such attempts and thwart the same at the threshold. Muslims can stop expecting the pampering and symbolism of the so-called secular establishment and start focussing more on securing substantial rights on the economic and educational front rather than crying hoarse over inconsequential emotional issues. It is also time for a more erudite and progressive leadership to emerge within the Muslim community. Being an optimist, I see a turning point in Indian Muslim history and would like to believe that this is an opportunity for the Indian Muslims to focus more on their long-term social and economic development and shed the image of an anachronistic community high on its emotional quotient and stuck in a time warp. As it is said “Zinda hota hai Islam Karbala ke baad” or something to that effect. A black cover page may be Mr. Burney's commercial idea of popularizing his new newspaper with Muslims. Mr. Burney is on the wrong path. His editorship should be aimed at illuminating his readers with emerging realities and how Muslims can adapt and deal with them.